I still can’t help but smile when I think about that incredible moment when I won Australia’s first the gold medal in Paratriathlon at the Rio 2016 Paralympics. But now, it's a new goal. Tokyo 2020. And so my long journey has started. To get there I’ve got a super coach in Dan Atkins, and a new Guide, Briarna Silk. To compete against the best means a new tandem bike, being made in California, at a cost of $28,000. Many of you who helped me with my first tandem which will be donated in time to a sports museum with the names of all contributors. Now I need to raise the $28,000 to cover all costs for the new tandem. So I‘m humbly asking for your support again. Katie Kelly competes as a Vision Impaired (PTVI) Paratriathlete on the International Triathlon Union (ITU) Paratriathlon race series. 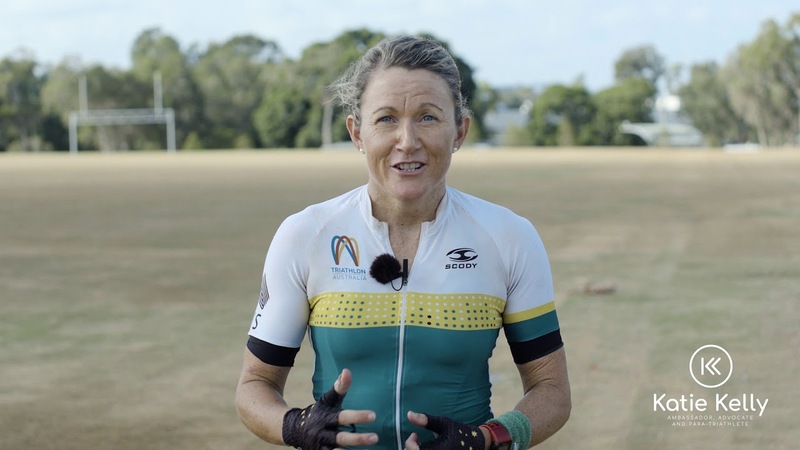 Katie won Australia's first medal in Paratriathlon where the sport made its debut at the 2016 Rio Paralympics with Michellie Jones as her Guide. Together they would also win the 2015 and 2017 World Championships. Paratriathlon is a multidisciplinary endurance sport that consists of a 750m swim; 20km bike ride and a 5km run. For the race as a Vision Impaired athlete I compete with a Guide. The athlete and guide are tethered for the swim, ride on a tandem bike and are tethered again for the run. Thank you for your support, in any capacity, it is valued and appreciated. You’re such an inspirational person. Go KK!! Thanks for being our inspiration. Love from your Usher family. Looking forward to seeing you with your new bike and on your way to the Games. Hi KK, Callum, the kids and I are in awe of what you\'ve achieved and what you continue to set for yourself to achieve. You are known to my boys as the cousin who is the best at riding a bike and swimming in the ocean.....and they aren\'t wrong! This is Just a very small appreciation for what you are doing for your country and your community. You are a dear cousin and I love you very much. GO YOU GOOD THING. Love the Helmolds. Your supporters are with you all the way! Love the sport, love the attitude of Katie. Can\'t not through a little help in there. PICA Group is pleased to be able to support Katie\'s efforts towards Tokyo 2020 and she carries the company\'s wishes of luck. Best of luck KK, very proud of you!! Great work KK. You are amazing!